For this week of transition, when the Capricorn* lunar cycle ends and the Aquarius lunar cycle begins, I am thinking about two cards from the Tarot—the Tower and the Star. ** In the Tarot the cards follow a set order. The Tower, a card depicting abrupt change, is followed next by The Star, a card of calm and hope. Together, these two cards tell a story about change that is important for our times. Both Tarot and astrology are archetypal symbol systems that reveal original patterns of nature. Tarot and astrology can be used together to show us processes of life that are eternal. The step between The Tower and the Star cards resembles the same step we take from this Capricorn lunar cycle into the next Aquarian lunar cycle. The original patterns help show the way as we take this step into new paradigms. Old paradigms/new paradigms. In the Capricorn cycle, we have had the opportunity to look at our structures—our towers—and take them apart to get to the essential building blocks. This process has been preparation for more dismantling of paradigms this year. The Capricorn lessons have helped us know the structures that support us. If we know what is essential, we are able to let go of the rest, freeing us to take up the Aquarius mission of ushering in new paradigms. The image of destruction and upheaval (The Tower) is followed by an image of grace and flow. The Star holds out a promise that from destruction, renewal is possible. Lessons from The Tower and The Star. Change is coming, though it will not look the same for everyone. For some, a lightening bolt will bring sudden change. For others, the process may look more organic, like the erosion of stone into sand. However it shows up, change is a constant. We are always in some form of change and in some form of building again from the rubble. In the last days of this Capricorn cycle, notice your relationship to this process. In the Golden Dawn system of correspondences, The Star card corresponds to Aquarius. This image teaches about the gifts of Aquarius and gives us insight about avoiding typical Aquarian missteps. With the name, The Water Bearer, many people assume that Aquarius is a water sign. But it is not. Aquarius is fixed air. The naked woman in this card pours out inspiration. She is pouring out ideas. Following The Tower, this card shows the inner calm that can help manifest Aquarian vision. The image of flow and the earth taking in the water shows us where we need to balance Aquarian vision with emotional connection and realistic boundaries. Without these elements, Aquarius feels impulsive and unproductive. If our essential natures are airy, we will do well to remember emotion and structure as we create from the foundations of our old towers. If we are missing air, then The Star card offers a way to embrace pure potential as a flow from the heavens. Grace and inspiration are all around us. Sunday, January 26. 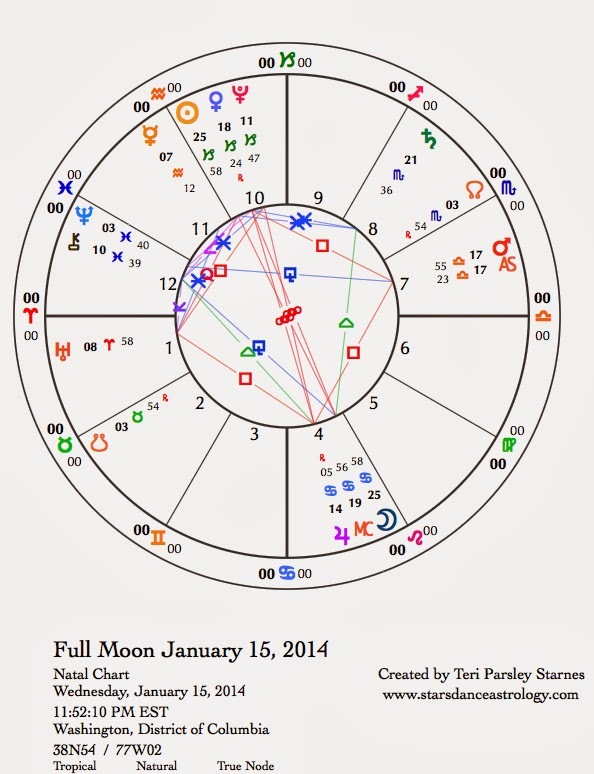 Energy can be low during a waning Moon, but that is not the case today. The Sagittarius Moon makes favorable contacts with the Sun and Uranus giving us hopes about the future. The day starts off with some confusing dreams that may be very revealing if you can remember them. It is good to sense the tender emotions lying under the surface before we get too caught up in the excitement of new adventures. Have fun; you deserve it. January 27—Balsamic Moon: Surrendering. Although technically, the Balsamic phase of the Moon begins today, we won’t really feel it until tomorrow when the Moon will be fully returned to the sign of Capricorn. Coming full circle. What do you recall about the start of this lunar cycle, which auspiciously began on New Year’s Day? How did you embrace the new year? Since then, what stones from your foundations are still holding up and which ones have tumbled to the ground? Honor the gifts of Capricorn from this cycle. Structure, mastery, and relationship with Time are some of the Capricorn treasures I have been appreciating. In this phase of surrendering, I release my hold on these stones, knowing they are strong by themselves. The Moon, while in Sagittarius, makes favorable contacts with Mars and Mercury. Get out excess energy by going to the gym, getting fresh air, or dancing away the winter blues (at least here in the ice bound upper Midwest!). Make a gratitude list. Imagine thankfulness as a sweet fire that warms you all over. Tuesday, January 28. Underlying tensions ensure we remember our foundations. Some may crumble today as the Moon triggers the current pattern of planets in tense configuration—Pluto, Uranus, and Jupiter are the paradigm changers of the zodiac right now. There are times we need to stand up for ourselves, and times to let annoyances go. Being able to discern the correct response for you is exactly the kind of foundation work Capricorn encourages. We are building core muscles. But that doesn’t mean we have to fight our way out of our problems. The Moon conjoins Venus tonight nearing the end of her retrograde journey. Venus has been helping us to firm up the relationships that support inner strength and standing our ground. Give thanks through creation or appreciation of Beauty. Wednesday, January 29. Most of the day is void-of-course for the Moon, and considering that this is the last day of a lunar cycle, it may be best to wrap up lose ends rather than try to initiate any new projects. The Star card (see week’s introduction) lunar cycle dawns tomorrow. Rest and reflection will help you with the flurry of action that is coming next. 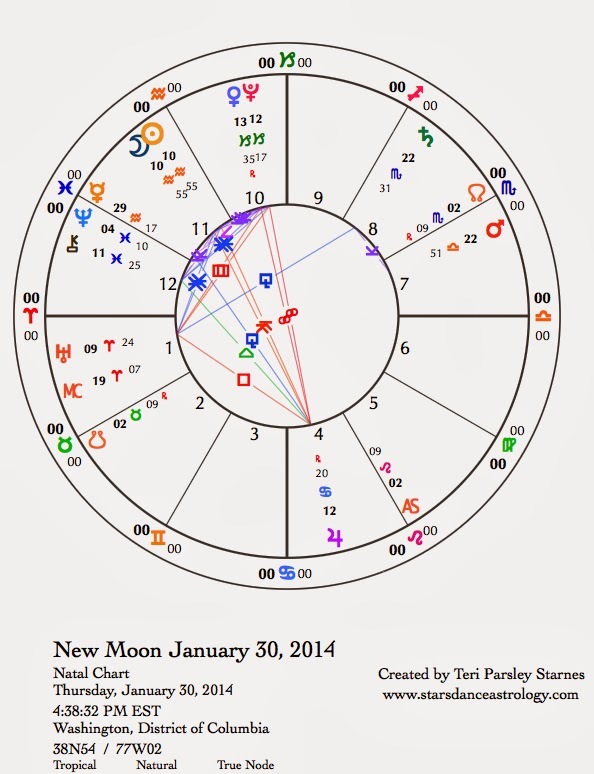 January 30—New Moon: Dreaming. We are deep into winter where I live, the very core of it in fact. In three days some will honor the sabbath of Imbolc, a holy day of celebrating the shift from our winter repose into our spring emergence. This shift is subtle. Right now where I live the temperatures are hovering around 0° F, but daylight lasts longer and the Sun travels higher in the sky everyday. Right now, the Sun’s angle of declination is the same as it was near the beginning of November. To honor this season, some of us invite the goddess Brigid to bless our fires of creativity, healing, vision, and justice. She tends the spark of the next growing cycle. Right now, we turn our attention to those flames of potential. Devotion to Brigid often takes the form of tending her sacred flame. Night after night, devotees to Brigid keep vigil over this fire. In the heart of winter, the New Moon in Aquarius is an opportunity to reflect on the fires of our hearts and how we keep vigil for our sacred flames. Even the smallest spark of inspiration can be nurtured at this time. Aquarius is a sign that envisions potentialities and asks, “Why not act now to create the future we desire?” Get ready to feel those winds of change and action as we increasingly wonder, why not now? The work of this lunar cycle is to make Aquarius vision more effective through connection to our tender hearts of emotion while planting our feet firmly on the ground of sustainability. Water and earth are allies; with these two anchors in place, inspiration pours out. To begin the dreams of this lunar cycle, we notice that Venus stations to turn direct tomorrow. Venus has taken an underworld journey of transformation to come back to a sensitive degree in Capricorn—conjunct Pluto, opposite Jupiter, and square to Uranus. These planets have been sounding the steady drumbeat of paradigm change. Venus reminds us of the primal importance of beauty and partnership to this work. The two goddesses, Venus and Brigid, are guides for us at this time. Friday, January 31. Big doings in the sky today. For one, Jupiter in Cancer opposes Pluto. We may feel blockages and oppositions in our own lives profoundly. When Pluto is active, we notice the fears and the exhilaration of blasting through stuck places. Jupiter asks us to orient ourselves to our deepest connections—family, hearth, and heart. What threatens the most precious things in your life? Don’t be surprised if a close examination reveals that you are the source of power after all. We can choose to reclaim power and lose our victim stance. Venus stations direct today—the journey, which began on Winter Solstice, ends. Important relationships have been cemented and those that don’t serve have gone away. Another thread—Mercury enters Pisces—we are attuning to mystical, mysterious messages. In a few days, Mercury will station retrograde (February 6), moving from this expansive connection back into the busy mental energy of Aquarius. Notice how these states of perception are different; we need both types of thought processes. When the Moon enters Pisces tonight (CST), exhale and remember emotional connection will serve us this cycle. What are you feeling? Saturday, February 1. Empathy is strong today. The Moon in Pisces makes harmonious contacts with Neptune, Jupiter, Pluto, and Venus. The undercurrents of conflict can be soothed by an open heart. Notice the difference between empathy and projection. The sextile between the Moon and Pluto gives us just enough edge to keep our own boundaries intact even as we sense into collective emotion.